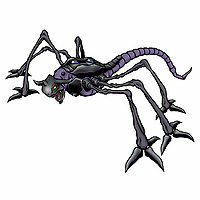 A Super-Ultimate Digimon that was born when Diablomon's Babies fused in large quantities, causing a mutation. Diablomon had the ability to make many copies of itself, but they were characterized by having lesser abilities than the original possessed. However, by producing Babies in large quantities and then fusing them, it did not disperse its abilities, but instead was able to attain power greater than Diablomon by condensing them into one being. Also, Diablomon-species Digimon are special Digimon that are affiliated with neither light nor darkness. 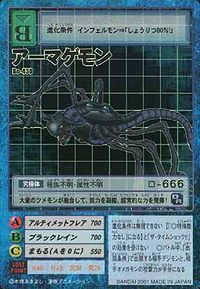 Its Special Moves are firing energy shells from its back into the sky, which fall like rain as scattered beams (Black Rain), and a destructive energy wave emitted from its gaping maw (Ultimate Flare). Title: 「ワールドブレイカー」 — "World Breaker"
Is short for Armageddon, the site of the final battle prophesied in the Bible. 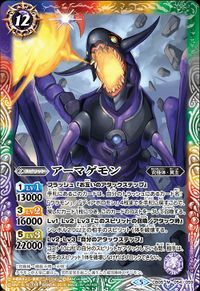 Ultimate Flare  アルティメットフレア Arutimetto Furea Destiny Destroyer/Ultimate Flare Fires a huge fire blast from its mouth. 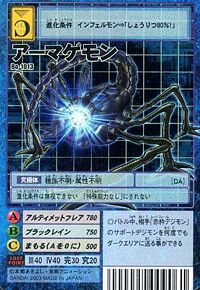 Black Rain  ブラックレイン Burakku Rein Full Scale Attack/Black Rain Launches several rocket like attacks from its back wildly into the air. 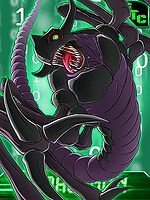 Thousands of Kuramon, under the command of the deceased Diablomon, emerged into the real world. Inoue Miyako sent them a message saying that the Chosen Children would be waiting for them at Tokyo Bay. They gathered there and fused into Armagemon. Taichi and Yamato came with Omegamon and battled against Armagemon, but was defeated. Daisuke and Ken followed up with Imperialdramon Fighter Mode but it became apparent that even he couldn't stand up against Armagemon. The crippled Omegamon gave what strength was left in him to Imperialdramon, transforming him into Imperialdramon Paladin Mode who, with one stab of his sword, slew Armagemon. An Armagemon was responsible for creating a vortex which threatened to collapse the Digital World. 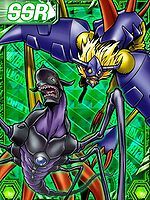 Culumon sealed the vortex, and Armagemon was defeated by Geo Greymon and Gaogamon. An Armagemon is an optional boss Digimon to be encountered before facing Lord Megadeath. After the main storyline, the World Champ will use Valvemon as his final Digimon if Atsushi already fought all 4 Amaterasu Leaders. 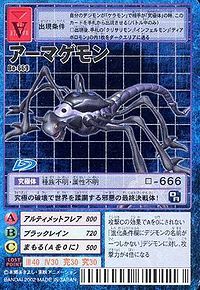 Armagemon is a Ultimate-level Black Digimon card with 65 AP / 62 HP. 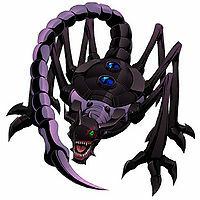 Appears as a boss Digimon in Core Field, guarding the gate to Chronomon's area. Cannot be obtainable or evolved from any Digimon. Armagemon is an available Burst Mode Evolution for Diablomon. It can be unlocked if level 65 or above with the item Black Tentacle. Armagemon is available as a Digimon Medal. Armagemon is the final form of the Keramon the main character and Shoma chase in the post-game episode. After being defeated as Diablomon in the Infinite Cauldron, he scapes and hides inside the Dimensional dungeon in the city. By the time the player finds him he's already digivolved into Armagemon. 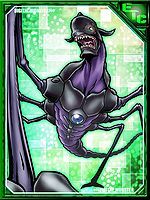 After being defeated he joins the city as the boss of Dimensional dungeon M and thus the player can fight him every day and he will drop chips or digivolution stones uppon defeat. This also allows the player to choose Kuramon's digi-egg upon reincarnation. Armagemon is also obtainable by jogressing Diablomon and Mugendramon. The events are the same as the original. 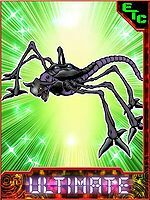 Armagemon is also obtainable by jogressing Diablomon with one of Mugendramon, Metal Seadramon, Piemon. Armagemon is an unobtainable Boss Digimon. It was made from the fusion of a massive number of Tsumemon, and condenses their powers into one. It possesses extraordinary power! This evil incarnate of the armageddon tramples upon the world as it brings about the ultimate destruction! 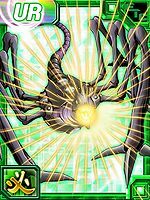 A Super Ultimate level formed when all of the Kuramon scattered across the world fused into a single body while in the Real World. It has inherited Diablomon's will and accomplishes its revenge on Omegamon. 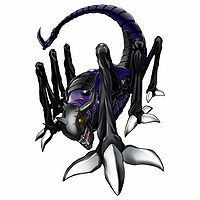 A Super-Ultimate Digimon that was born when Kuramon fused in large quantities, causing a mutation. This page was last modified on 10 April 2019, at 00:26.